« One Day Sale Jan 14th, 2016!! I must still be asleep and dreaming, right? 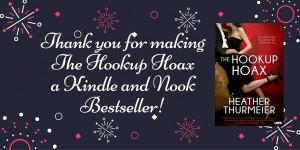 Or did I really just find THE HOOKUP HOAX at number 43 in the Kindle store and number 6 in the Nook store?? 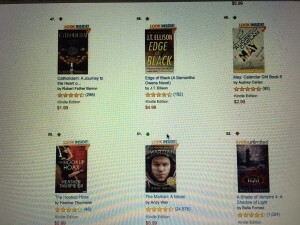 I was excited for my sale, but I never dreamed I’d find numbers like this!! I’m so thrilled!!! Just look at this! The Hookup Hoax was at 50 when I checked at 6:30 this morning. I’m next to the Martian!!! I loved that book! And then… I went up again! And now I’m at 43!! WooHoo!!! 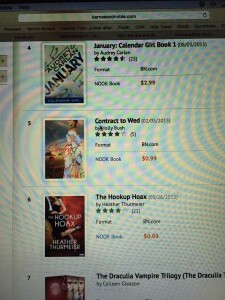 But that’s not all… The Hookup Hoax is also at number 6 in the Nook store on B&N!!! How crazy awesome is that?!?! I just can’t say thank you enough to everyone who shares my sales posts, who purchases a book, who chats with me online, and who simply just supports me on this crazy journey of writing! You are all awesome.